Weathering The Storm - Hurricane Irma! 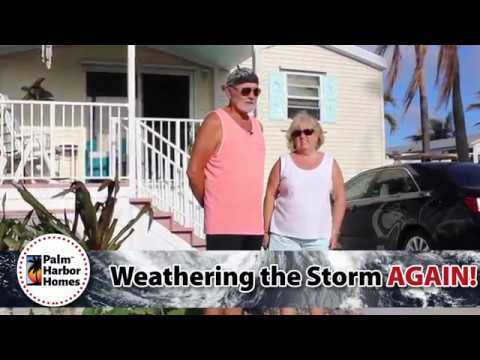 Palm Harbor Homes – BUILT IRMA STRONG! We were not quite sure what to expect after the hurricane. 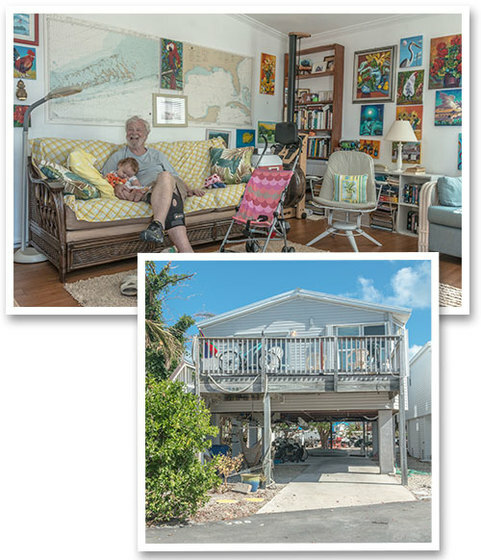 Our home is over 20 years old and has been through multiple hurricanes. But Hurricane Irma was a monster. When we returned home, we were thrilled to see that the only damage was that our back porch was gone and we had lost some siding from our neighbor’s totally destroyed home. We are very happy with our Palm Harbor home. 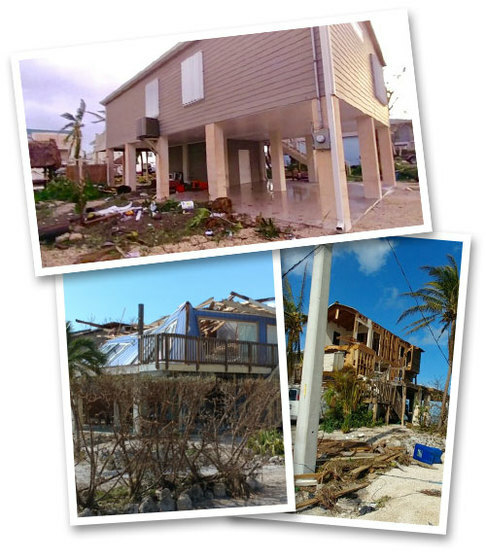 My house was one of the 100 plus homes of the 659 homes in Venture Out Resort in Cudjoe Key that was destroyed by Irma. But all 15 of the Palm Harbor homes in our neighborhood survived Hurricane Irma. Not one Palm Harbor was destroyed. Hello, Palm Harbor – Plant City, Florida! I have wanted to write for a long time. My late husband and I bought our new home from you after a house fire in Feb 2002. Our home was called the Full House. Love it! Love it! It has been 15 years since then and I still love it today! In 2004, shortly after my husband passed away in July, we were in the midst of 4 hurricanes, Charley, Francis, Ivan and Jean. Ivan and Jean being the closest. My Palm Harbor home was so well put together that I didn’t even realize we were having a storm. I felt very secure. Now 13 yrs later with the threat of Hurricane Irma, my home was secure and sound. I had my window panels put up and barely knew a storm was there. The storm was fierce here in St. Petersburg, too. But not one shingle or siding came off. Am I lucky? Probably. But you build great homes. I tell people how much I love my home and recommend Palm Harbor Homes to everyone. I have never regretted the choice my husband and I made and I’m happy to give you a happy customer review. Thank you! 95% + every house in our area was damaged or completely destroyed. Most houses that looked as if they had minor outside damage were completely destroyed inside by water damage due to roof, soffit and eve failures. Our house was in the middle of the damage and we have ABSOLUTELY ZERO damage inside and out. The only thing that didn’t survive was the landscaping, car and contents in the downstairs enclosure which was minimal. We had 46“ of water in the enclosure without any damage to the structure. We noticed other new Palm Harbor homes with no damage. THANK YOU FOR AN AWESOME BUILT HOME!!!!!!! 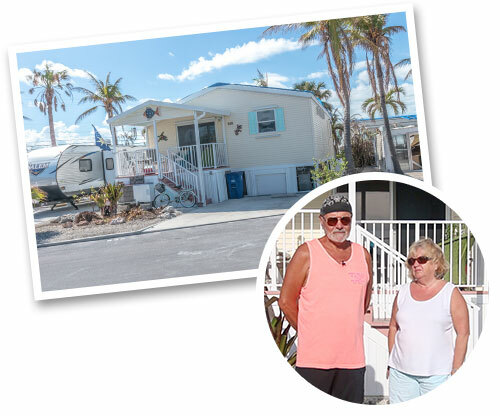 We have been through 5 major hurricanes, in the past 15 years, and our Palm Harbor home is still standing. Thank you for building such a quality home. Kudos to Palm Harbor Homes in Plant City, Florida. We just went through Hurricane Irma in Ruskin, Florida, and no damage whatsoever! They are built strong and beautiful! Thank you so much. We did not know what we would come home to, but it’s perfect ??!! I live in Venice, Florida. I bought a new Palm Harbor home in 2003. I was so happy when I came back. We had no damage at all. Just wanted to thank you for a well built home. I would be happy to do a commercial for Palm Harbor Homes. The fear that I felt was very real, actually I thought I was going to die!!!! It sounded like a freight train and the 2 semi-tractor trailers heading straight for me. Heard it, felt it, screamed for my husband, and couldn’t believe I wasn’t airborne or dead. I will pass this on when selling…safer than stick built!!! Now I can add a story of my home and I survived IRMA. Way to build a STRONG HOME, PALM HARBOR! Selecting a new or used Home is a BIG decision. Our team here at Palm Harbor in Seminole - Hobbs is dedicated to listening to your needs and offering you the best housing options. Shop locally and save time and money at our convenient location. We service all of Southeastern New Mexico and West Texas from our beautiful 5 acre location. We specialize in manufactured homes and can provide single wides, double wides, triple wides, modular, oilfield housing and much more. Own Land? There are several loan programs available if you need financing. Come see us from Carlsbad, Ruidoso, Alamagordo, Roswell, Portales, Lovington, Clovis and all of Southeastern New Mexico. From Texas we can help all you folks in Lubbock, Brownfield, Seminole, Andrews, Midland, Odessa, Lamesa, Kermit, Denver City, Pecos, Monahans and the entire Permian Basin. From Hobbs: Take the Seminole Highway (US 180) East and go less than 1 mile past the New Mexico/Texas state line. Palm Harbor Homes will be on your right. From Seminole: Take the Hobbs Highway (US 180) West. Palm Harbor Homes will be there on the left just past the Texas/New Mexico state line.